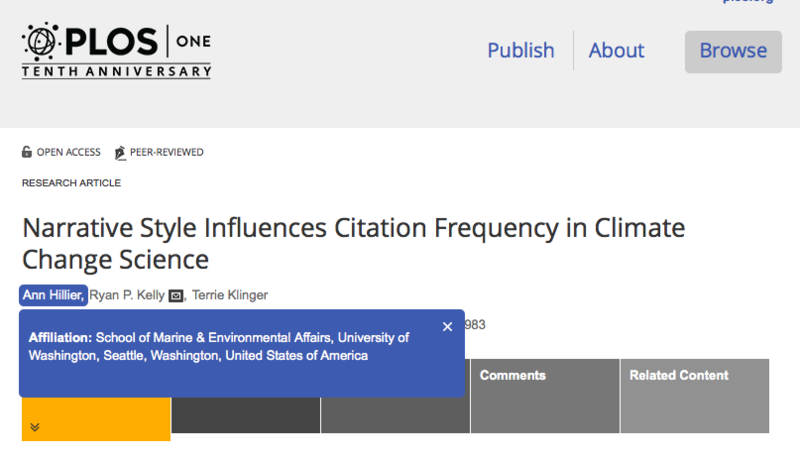 Last month PLOS published a paper titled, “Narrative Style Influences Citation Frequency in Climate Change Science” which was a nice study, BUT… How do you write a paper about “narrativity” in scientific papers and not discuss the IMRAD narrative template that scientists began using a century ago? How can you use the word “influences” in the title if you did nothing more than correlations? Why would you over-complicate things by using “narrativity” instead of just narrative structure? The paper stands as a monument to the lack of “narrative intuition” in the science world. Other professions (business, law, politics, advertising) already know that narrative structure underpins all communication. EVERYONE knows that narrative is central to all communication. Except, apparently some scientists, who lack intuition and thus need data. The bottom line is the same old thing, don’t be such a scientist — the world needs your efforts actually using narrative dynamics, not questioning their value. A MONUMENT TO THE LACK OF NARRATIVE INTUITION IN THE SCIENCE WORLD. Bob Dylan once said, “You don’t need a weatherman to know which way the wind blows.” If you have the least bit of common sense/intuition you can walk outside and figure it out for yourself. The idea that science communication benefits from narrative structure was established a century ago by a generation of scientists with much deeper understanding for communication than today’s scientists. They created the IMRAD Template which today underpins the communication of pretty much all scientific papers. If you don’t know what IMRAD stands for, Google it. If you’re a scientist, you should know. BUT THEN … I turn back to the science world and what do I see? A paper presenting “data” to “prove” that “narrativity” matters. Which is true. It does matter. Of course it matters. It’s why scientific papers morphed from their original non-narrative form in the 1600’s to the structurally regimented narrative form of today using the IMRAD elements. There’s nothing wrong about their paper (except using “influences” in the title — isn’t that the same as causation when all they present are correlations? I don’t see any controlled experiments). If you really are stuck back in the 1600’s, needing evidenced-based arguments to convince you narrative matters, then I guess it’s the paper for you. But seriously, the point was made a century ago. The major thing everyone should learn from this paper is that no other professions feel the need to question the importance of narrative. This is the handicap that science suffers from — a vast lack of intuition when it comes to communication. It needs to change. It has to change, given the coming anti-science onslaught, starting with Robert F. Kennedy, Jr. this week (sheesh! ).